Elegant and distinctive, the new "Via del Corso" dress shoes by GuidoMaggi feature a particular burnished brown tip in greased calfskin. The side and back parts of the upper, are in light brown calfskin, accurately hand-painted. Entirely handcrafted and hand punched with medallion tip design. The inner lining is made of soft goatskin leathertheoutsole, insole and midsole in genuine Italian leather, are joined and sewn at sight. The heel in genuine leather with anti-slip rubber, the laces are cotton waxed. The inner height increaser - anatomic and tested - can be chosen between 2.4, 2.7 or 3.1 inches. 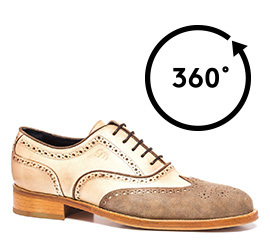 The GuidoMaggi craftsmen allows a range of possibilities for customization.